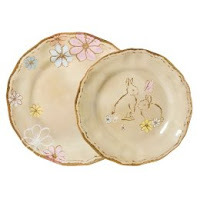 These plates are a little pottery and a little Beatrix Potter. Also, they're made of melamine, which can actually survive outdoor eating, the dishwasher, and other hazards of real life. Features dinner + salad plate for four. From Target.